Having recently added Jefferson’s and Masterson’s to my list of ryes, I now turn to WhistlePig. The trio often gets lumped together since they all source their straight rye from the same Alberta distillery, and all are made with a mashbill of 100% rye. That makes them similar, but not identical. From a technical aspect, the difference is proof: Jefferson’s (10 year, 94-proof), Whistlepig (10 year, 100-proof), and Masterson’s (10 year, 90-proof). Having tasted all three, it’s clear each has a character all its own. Unlike the others, WhistlePig has taken steps to be more than just a brand and a bottler of whiskey made elsewhere. WhistlePig plays up its Vermont roots on the bottle prominently. Currently, the outfit is just bottling and aging whiskey on the “WhistlePig Farm” in Shoreham, but it has broken ground on a distillery (a dispute with a neighbor delayed permitting) with the goal of distilling the rye it grows on-site. The light copper-colored rye features a nose full of honey and candied cherries, with less of the floral and spice notes often found in Jefferson’s or Masterson’s. This would be a theme for WhistlePig, which features a rounder, more bourbon-like edge than it’s Canadian compatriots. This is almost certainly due in part to the fact that WhistlePig is re-barreled in bourbon casks in Vermont for an additional period of aging. The palate starts very bourbon-like at first with maple, vanilla, and wood, but the distinctive rye floral and clove spice is also there, especially on the finish. The finish is medium in length with additional notes of butterscotch. 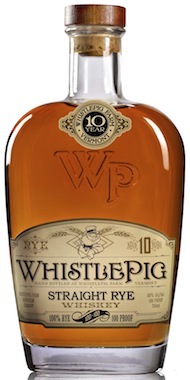 WhistlePig really delivers, with a sweeter, more rounded, and less dry version of the Canadian 100% rye distillate. At $75 per bottle, its price is on par with Masterson’s and nearly twice that of Jefferson’s (although the latter is no longer being bottled). In the new landscape of bourbon and rye, the price isn’t a bargain, but it’s not unfair for a 10 year rye since well-aged ryes are so hard to find. Like all good ryes, WhistlePig goes great with a fine cigar. Its intensity is too much for a mild smoke, but it still demands a balanced cigar. Good candidates include the Tatuaje Black, Romeo y Julieta Short Churchill (Cuban), and Paul Garmirian 15th Anniversary Robusto. But you can’t go wrong with this flavorful rye and any good smoke.